Although it’s expected that every decision made on a claim is accurate and fair, the reality is that it is not always the case. Claim decisions are often made based on the information available at the time, the decision-makers interpretation of legislation and/or adherence to policy and procedure. At the primary level of adjudication, within the WCB, there is very little room for considering each case on its own merit. Sometimes there is additional information submitted that can affect the rationale used to make decisions. Sometimes, the decisions just don’t make sense and need to be addressed. A questionable decision does not only affect an injured worker but it can also have a serious impact on an employer. Based on current WCB legislation, any interested party wishing to appeal a claim decision must do so within one year of the date the decision was made. Therefore it is imperative to make sure that all decisions made on a claim are reviewed for accuracy and relevance. Employers are responsible to arrange their own representation and unfavourable decisions can be made if an employer or their representative is not present to provide information and documentation to support their position. The opportunity for a favourable outcome is greatly influenced when qualified professionals present appropriate information and knowledgeable appellants reference relevant policy. Employer’s interests should be represented at all hearings, even worker’s issues of appeal. Injured workers have access to Appeals Advisors assigned by the WCB employers do not. Preparing an appeal and arranging to be present at hearings, whether it is in person or by phone, can be extremely time consuming. Attempting to understand the WCB process, the decision-making guidelines, the appropriate legislation and/or policy can be complex. Identifying, tracking down and obtaining supporting documentation can be frustrating. Moving forward with an appeal without being properly prepared or taking short cuts can be costly. BCL can identify issues of appeal, indicate the potential for success, prepare the appropriate documentation and represent your interests at all levels of appeal or review. Our commitment is to ensure that employer’s rights are upheld by using relevant information, policies, practices and past experience to support our position. 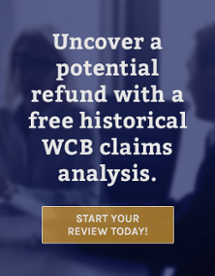 Our team includes former WCB employees, who combined with our extensive experience of WCB review proceedings provides us with a unique expertise and insight into the appeals process. We can quickly identify the potential success or difficulty of pursuing an appeal on any decision or issue. We can access relevant policies and reference past appeals to provide the strongest case possible. Even if we aren’t confident of a favorable outcome, we are willing to go the distance and challenge the WCB on your behalf, using all the tools and resources at our disposal. We know how provide the right information to the right people at the right time, how to present your case with the greatest opportunity of success while saving you time, energy and frustration!